CARFAX Certified 1 Owner - No Accidents - Fully Serviced - Quality Certified W/up to 10 Years, 100,000 miles Warranty This Mercedes-Benz includes: SPORT PACKAGE NAVIGATION REAR VIEW CAMERA MULTIMEDIA PACKAGE PREMIUM 1 PACKAGE *Note - For third party subscriptions or services, please contact the dealer for more information. * CARFAX shows that this is a one-owner vehicle -- no wonder it's in such great condition. This is a Certified Mercedes-Benz C-Class, which means it has been thoroughly inspected against a set of stringent standards. Only vehicles that pass this inspection can be sold as Certified. The Mercedes-Benz C-Class C 300 Sport's pristine good looks were combined with the Mercedes-Benz high standard of excellence in order to make this a unique find. Start enjoying more time in your new ride and less time at the gas station with this 2016 Mercedes-Benz C-Class. This Mercedes-Benz C-Class features AWD. That means power and control delivered to all four wheels for maximum grip and improved handling. You can tell this 2016 Mercedes-Benz C-Class has been pampered by the fact that it has less than 30,007mi and appears with a showroom shine. Feel at ease with your purchase of this Mercedes-Benz C-Class C 300 Sport, all records are included allowing you to truly know what you're buying. If not for a few miles on the odometer you would be hard-pressed to know this 2016 Mercedes-Benz C-Class is a pre-owned vehicle. Price. Performance. Protection. This vehicle has it all, including a manufacturer's warranty. If you're looking for world-class speed, acceleration, cornering and handling, don't blink because you'll miss this truly amazing automobile. Why go with a basic vehicle when you can have it all in this well-optioned Mercedes-Benz C-Class? Enjoy the drive without worrying about directions thanks to the built-in navigation system. High-performance tires are another option found on this vehicle. There is no evidence of prior damage or paintwork on this Mercedes-Benz C-Class C 300 Sport. A perfect find to complement any rare automotive collection. This beautiful lass will turn heads everywhere she goes. More information about the 2016 Mercedes-Benz C-Class: The C-Class has traditionally been Mercedes-Benz' entry-level car. However, with the arrival of the CLA, the C-Class is no longer the German automaker's least expensive model. Mercedes-Benz has packed the 2016 C-Class full of upscale technology, determined to make the car feel anything but entry level. Despite this move upmarket, pricing on the C-Class remains competitive with other European small sedans such as the BMW 3-series. The 2016 C-Class starts at around $40,000. Interesting features of this model are high-end features, all-wheel drive, Attractive modern styling, fuel-efficient diesel and hybrid engines, plus powerful turbocharged engines, and typical Mercedes-Benz luxury No Credit / Bad Credit / No Paystubs, No problem !! ! All Approved ! Everyone drives ! CLEAN, GORGEOUS, LOW MILES, SHOWROOM CONDITION. CALL NOW QUALITY CERTIFIED up to 10 YEARS 100,000 MILE WARRANTY , To Certify a vehicle, there will be an additional cost for Certification. CALL NOW For details. STUNNING AGGRESSIVE LOOK ON THIS BEAUTIFUL--Call today to schedule a test drive... Good Credit/Bad Credit/No problem!!!! Get paid cash? No problem!! 100% Credit Approval with interest rates starting at 2.49% for qualified customers, our rates will not be beaten. We price our cars at wholesale price to guarantee the best deals for our customers. Our inventory moves quick, please call to confirm the availability of the vehicle of your interest Springfield location 973-564-0112. This vehicle is located at our SPRINGFIELD location. Come visit our new showroom in Springfield NJ. This Mercedes-Benz includes: *Note - For third party subscriptions or services, please contact the dealer for more information. * This is a Certified Mercedes-Benz C-Class, which means it has been thoroughly inspected against a set of stringent standards. Only vehicles that pass this inspection can be sold as Certified. Quality and prestige abound with this Mercedes-Benz C-Class. If you are looking for a vehicle with great styling, options and incredible fuel economy, look no further than this quality automobile. All-wheel drive means peace of mind all the time. This Lunar Blue Metallic AWD Mercedes-Benz enjoys a host offeatures, including exceptional acceleration and superior stability so you can drive with confidence. Low, low mileage coupled with an exacting maintenance program make this vehicle a rare find. More information about the 2016 Mercedes-Benz C-Class: The C-Class has traditionally been Mercedes-Benz' entry-level car. However, with the arrival of the CLA, the C-Class is no longer the German automaker's least expensive model. Mercedes-Benz has packed the 2016 C-Class full of upscale technology, determined to make the car feel anything but entry level. Despite this move upmarket, pricing on the C-Class remains competitive with other European small sedans such as the BMW 3-series. The 2016 C-Class starts at around $40,000. 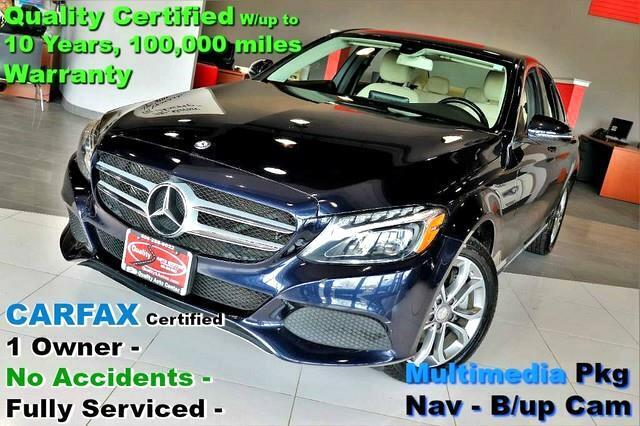 Interesting features of this model are high-end features, all-wheel drive, Attractive modern styling, fuel-efficient diesel and hybrid engines, plus powerful turbocharged engines, and typical Mercedes-Benz luxury No Credit / Bad Credit / No Paystubs, No problem !! ! All Approved ! Everyone drives ! CLEAN, GORGEOUS, LOW MILES, SHOWROOM CONDITION. CALL NOW QUALITY CERTIFIED up to 10 YEARS 100,000 MILE WARRANTY , To Certify a vehicle, there will be an additional cost for Certification. CALL NOW For details. STUNNING AGGRESSIVE LOOK ON THIS BEAUTIFUL--Call today to schedule a test drive... Good Credit/Bad Credit/No problem!!!! Get paid cash? No problem!! 100% Credit Approval with interest rates starting at 2.49% for qualified customers, our rates will not be beaten. We price our cars at wholesale price to guarantee the best deals for our customers. Our inventory moves quick, please call to confirm the availability of the vehicle of your interest Springfield location 973-564-0112. This vehicle is located at our SPRINGFIELD location. Come visit our new showroom in Springfield NJ.